LIMA, Dec 8 2014 (IPS) - Even as the presence of major oil and gas corporations is nearly ubiquitous at the U.N. climate talks in the Peruvian capital known as COP20, fossil fuel divestment campaigns have gained ground in various countries and are moving to counter the influence of the “dirty energy” lobby here. As the COP20 enters its second and final week, delegates from 195 countries are still trying to address the urgency of climate change by reaching an international agreement to decelerate global warming. However, activists are worried that the influence of fossil fuel companies within COP20 might slow down an already sluggish process. The premise is simple, according to the movement organisers: if it is morally wrong to wreck the planet, it is morally wrong to profit from that wreckage. In response to climate inaction, student organisers have called for fossil fuel divestment. The movement aims to disinvest endowments from a list of 200 companies that are ranked by the largest known fossil fuel reserves. Divestment campaigns advocate full divestment from the list, which includes Gazprom, Petrobras, PetroChina, Chevron and ConocoPhillips, among other major companies. The intention of the campaign is both to erode financial support for major oil corporations, as well as revoke their own moral license. Maddy Salzman, a former organiser of Fossil Free Washington University, sees divestment as a potential solution to the current stalemate on climate action. “The necessary legislation and investment decisions cannot and will not be made in our current political system, and as citizens we must play a role in making the changes we believe in,” she told IPS. The motivation behind the campaign stems from a 2011 Carbon Tracker Initiative report which warned that about four-fifths of the total known fossil fuel reserves worldwide must remain in the ground in order to avoid the worst impacts of climate change. There are hundreds of campaigns across four continents seeking fossil fuel divestment. While most of these campaigns target university endowments, they also include state pension funds, cities, and places of faith. Some campaigns, including at U.S. and Canadian universities, have already succeeded in obtaining commitments from their investment officers to divest their funds. Divestment campaigns, while local, connect to broader international issues. Students involved with fossil fuel divestment campaigns are quick to acknowledge that their movement is a global one – an international solution that parallels the stalemate at the U.N. In fact, they’ve recently launched Global Divestment Day, a day of action to elevate the growing momentum around fossil fuel divestment campaigns. In the case of the U.N. climate negotiations, divestment has helped shed light on the influence of the fossil fuel industry at these talks. “Even here at the annual meeting to create global policy to respond to climate change, fossil fuel companies have an influential pressure and continue to dilute the strength of the outcome of the COPs,” Dyanna Jaye, chair of the Virginia Student Environmental Coalition, told IPS. “While the science becomes increasingly alarming, we continue to be fed another profit-driven story about continuing the use of fossil fuels,” said Jaye, a youth delegate with the SustainUS youth advocacy group in Lima. On Monday, climate activists at the U.N. talks protested outside an event hosted at the conference venue by fossil fuel giant Shell. The event, initially titled “Why Divest from Fossil Fuels When a Future with Low Emission Fossil Energy Use is Already a Reality?”, has since changed names and times on multiple occasions. 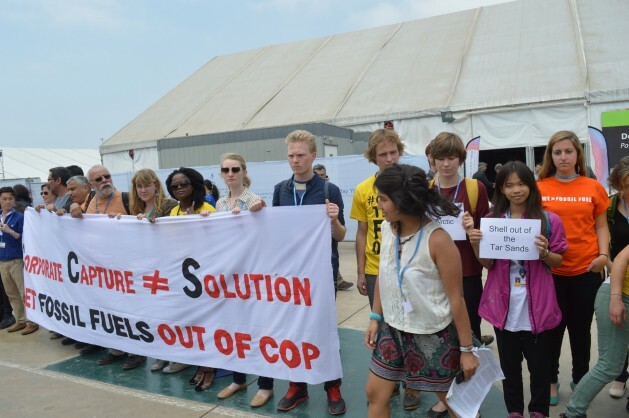 Sally Bunner, an organiser with Earlham College Responsible Energy Investment, explains why fossil fuel companies cannot be part of a solution at COP20. The Shell event is not the only example of industry presence at the conference. Oil companies have been meeting with delegations from numerous countries negotiating in Lima. On Saturday afternoon, the British Columbia Minister of Environment, Mary Polak, tweeted that she was going to meet the Climate Change Advisor for Chevron, a major player in the fossil fuel industry. Representatives from both Chevron and TransCanada have participated in closed stakeholder meetings with the Canadian delegation, designed to brief Canadian non-governmental organisations. While they are allowed to be present in those meetings, many youth delegates have noted the disproportionate representation of a stakeholder that comprises such a small number of the general Canadian population. Brainwashed “useful fools” have to read Milankovich cycles, at least in Wikipedia. Whole idea behind “global warming” is to de-fund GOP.